After a discussion about Technical Debt (aka TDebt) in Thoughtworks I realized something: Technical Debt is just like cancer. There are several similarities between the disease and this "condition" that happens quite frequently in development projects. There is a line in medicine that says that if you live long enough you will develop some sort of cancer because organisms have intrinsic failures that will manifest themselves if enough time is given. 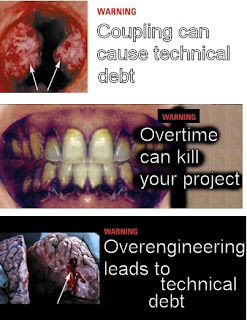 An IT project that lives long enough will present TDebt related problems. Cancer can develop from external factors or congenital predispositions. Tobacco, sunlight or too much tuna can disturb your organism to a point of metastasis. Less than good design/coding decisions affect the general project’s health in similar way. If the team chooses to cut corners and develop bad code intentionally TDebt will build up. As for the congenital problems that may be circumvented by using some tools. From a Java angle it can be FindBug or PMD to continuously inspect congenital problems related to the technology stack of choice. No one wants to discover a cancer but once you find it you need to take some action or it can have terrible effects. Tackling TDebt is hard and many choose to put it off until it's too late. However if the case is a terminal one, then nothing can be done. All you can hope for is for it to live long enough to fulfill its purpose. Different types of problems require different procedures. But seems that the most popular and successful approach is: isolate and remove. Early detection and prevention are key. The sooner the problem is identified the easier it is to heal. Regular check-ups are a Good Idea™. If a potential problem is detected it should be examined to determine whether it is benign or malign. After that one can decide the course of action. Also there's no point in being a hypochondriac, this shouldn’t consume the team’s time away, it’s preventive not obsessive. Some people get worse after they discover a cancer because their moral gets shot. Projects slow down because of TDebt, which gets devs very de-motivated. TDebt makes things unnecessarily complex turning simple tasks into major efforts. Anything that impairs people from living normal lives have devastating effects on their will. When do you communicate to your family and friends? To what extend TDebt should became visible to the business? I'd say that the approach depends on the severity of the case. Less seriously cases can be treated internally without making a big fuss, but if more people, money and support are going to be required to reestablish the healthy state then stakeholders need to fully participate in the process. Bottom line, have healthy habits (TDD, simple design), prophylaxis (refactoring), use tools to monitor congenital problems (FindBug/PMD) and frequently consult your doctor for a code health check-up.